You can relax and unwind after a hard and troublesome day at work in nature, in a sauna, or just at home, wrapped in a blanket with a favorite book in your hands or a TV remote control. Many people like to just take a shower, lie down in a warm bathtub filled with fragrant foam. To make your stay even more comfortable and relaxing, you should take care not only of aroma oils, salts, and foams, which help relieve stress, tension, and fatigue but also about the interior of the room itself. 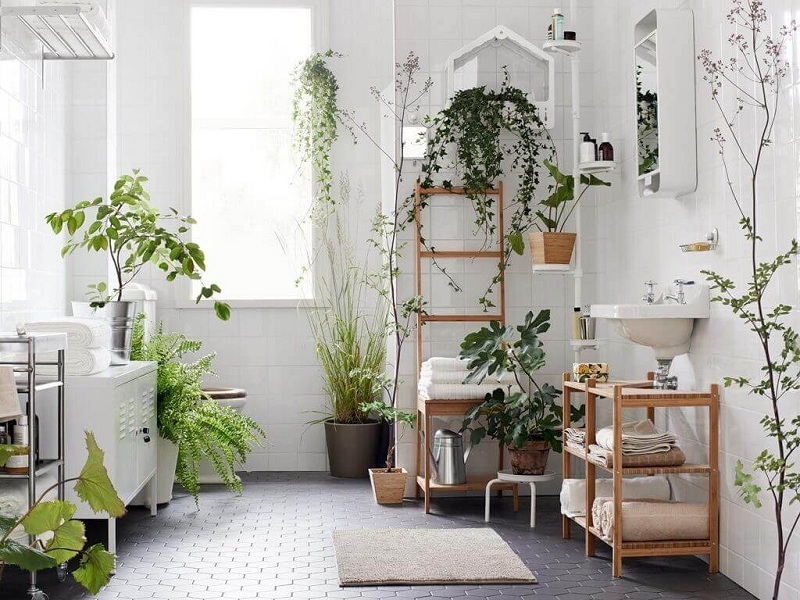 What plants can be placed in the bathroom? Deodorize the air and act as a barrier to the spread of unpleasant odors. The plant that you are going to place in the bathroom should be moisture and shade-loving (could grow without enough sunlight). Must fit the interior of the room (with the design it is best to trust the experts or get acquainted with the ready-made options). Should not interfere with water procedures. If all these conditions you can meet, then you can proceed to the choice of the plants themselves. 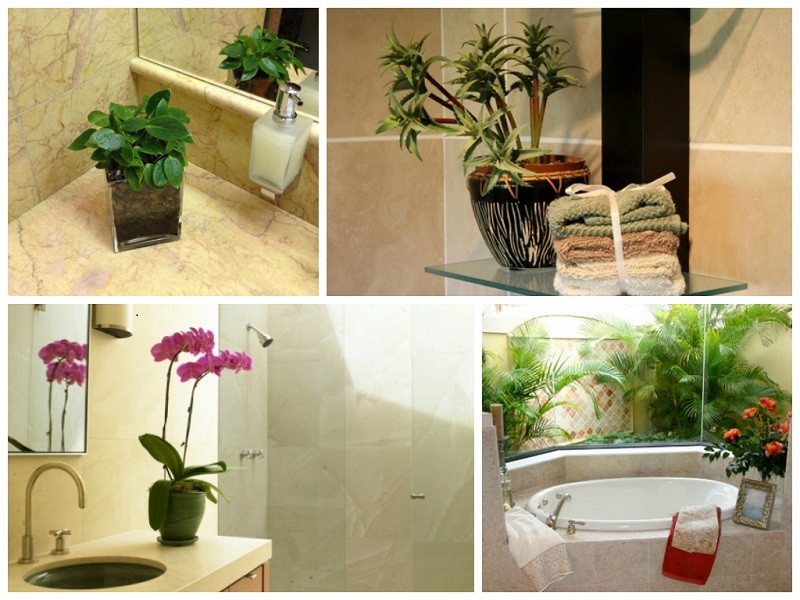 For landscaping, the bathroom fit almost all tropical species. This plant is popularly called “agave”. And this is due not only to the peculiarity of care for him (perfect unpretentious to the conditions) but also to use and even healing properties. 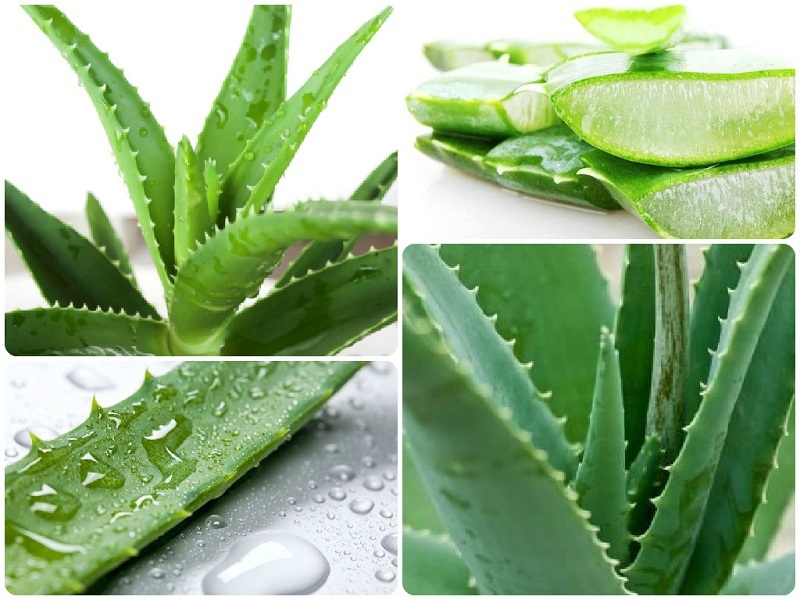 The fleshy leaf of aloe is used in the preparation of masks, compresses, as well as in the treatment of burns, abrasions, and cuts. Many people prepare syrup from cold from agave, mixing in equal proportions finely chopped leaves with honey. Scarlet, though not a flowering plant, but with its greens is able to decorate the interior and make notes of comfort. Very often you can see that the tips of the leaves dracaena dry, turn brown. This comes from a lack of moisture. 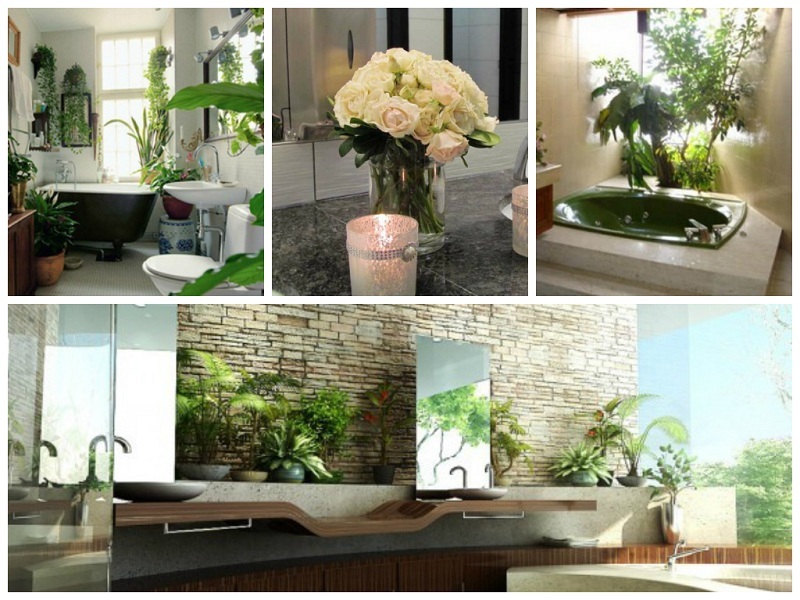 If you keep a pot of dragon flower in the bathroom, you will cope with the solution of several tasks at once: create comfort in the bathroom and place the plant atmosphere with natural humidity. 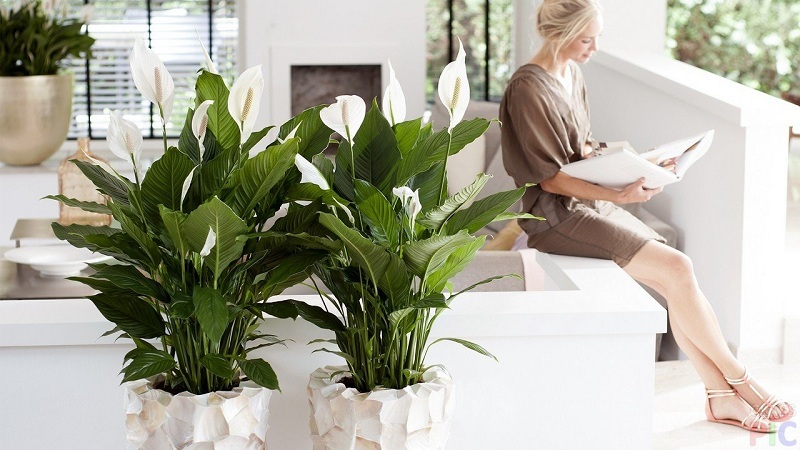 Another unpretentious plant that will feel great in the proposed conditions is the spathiphyllum. It should be noted that this plant will delight you not only with its chic greens but also with white delicate flowers. In addition to aesthetics, this flowering plant is able to clean the air from household impurities. 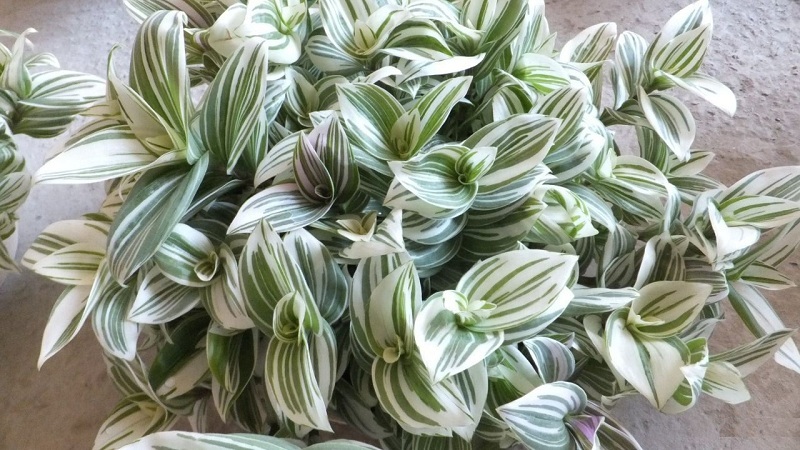 The moisture-loving and shade-tolerant chlorophytum will delight you with its gorgeous greenery and new shoots that it produces on thin stems, resembling a waterfall. Tender leaves of Tradescantia are able to clean the air from dust and germs, as well as harmful bacteria. This absolutely picky plant perfectly adapts to the growing conditions. Easy to care and breed. 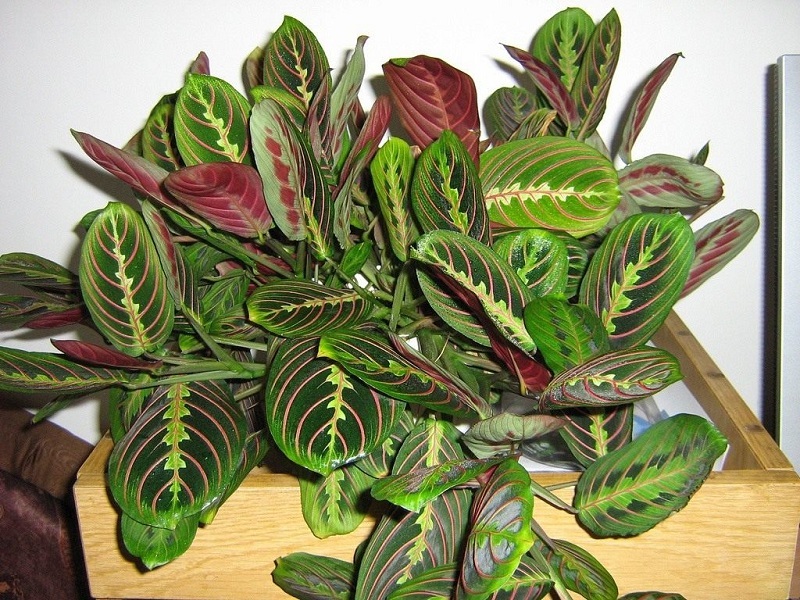 Bright colorful colors of arrowroot leaves will enliven the room, lift your spirits. This plant prefers penumbra, abundant moisture, and frequent watering, so it is perfect for growing in the bathroom. 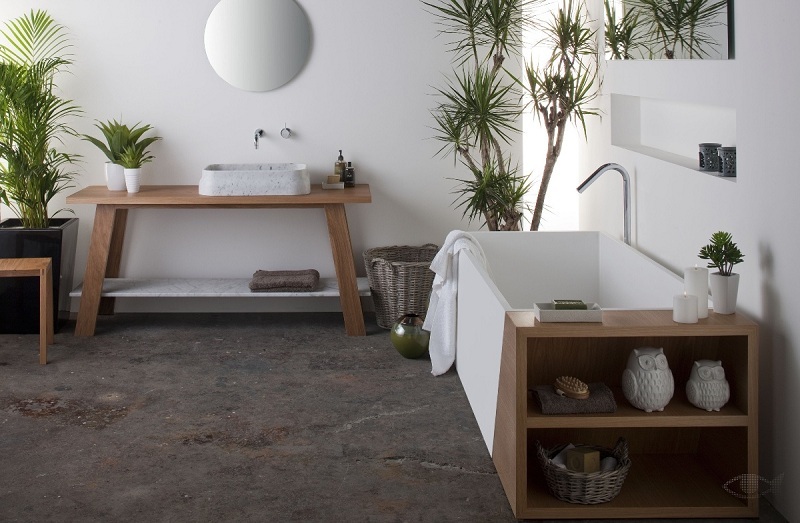 A wonderful solution in decorating a small bathroom can be hand-made flerovium. 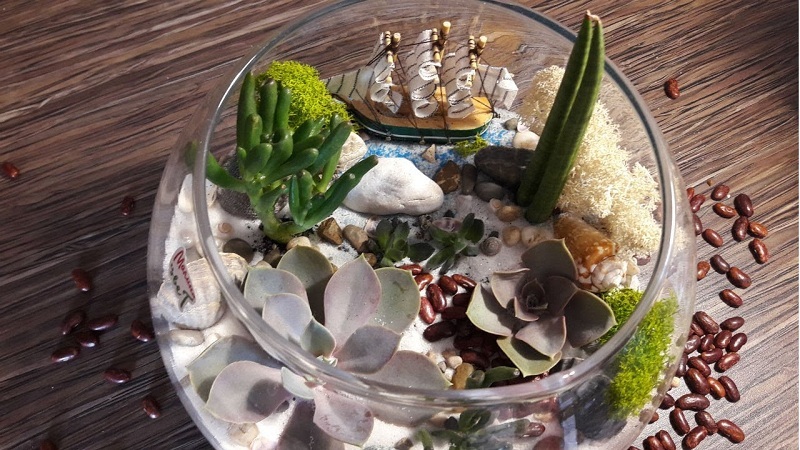 This unique mini-garden in a vase or decorative bottle allows you to create a piece of rainforest in the room. The peculiarity is that inside the tank its own ecosystem is formed, which regulates plant growth, temperature, humidity level. Selected plants constitute the complete composition. They grow slowly and therefore long retain their decorative appearance. Care for flerovium minimum. Watering succulents 1 time in 2 weeks will be enough! Similarly, the flerovium can be made with his own hand and moss terrarium. It looks almost identical with the above compositions; the only difference is the components. As you might guess from the name, fill the glass (or other transparent) containers should be moss. For decoration, many craftswomen put decorative figures and mini-copies of various objects inside with greenery. As you know, moss is a plant that grows in damp, shaded areas. 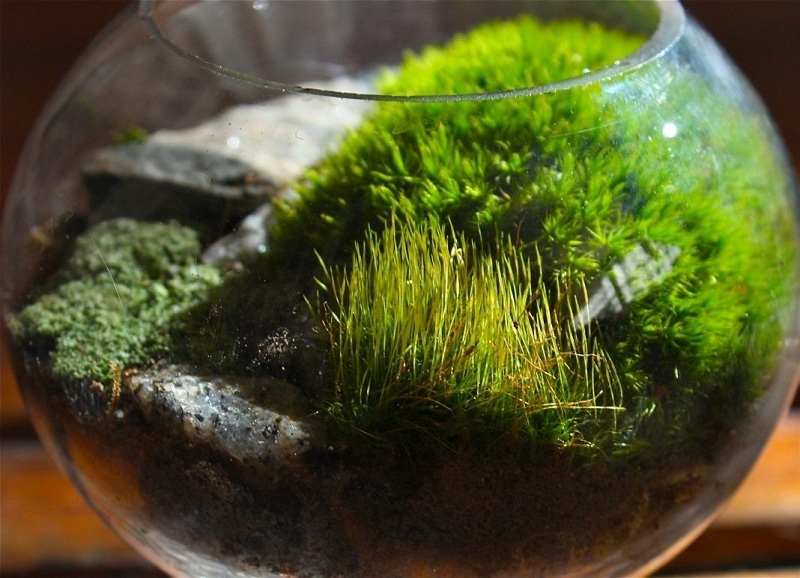 Therefore, the moss terrarium is suitable for decorating the bathroom as well as possible. Moreover, the care of the terrarium is very simple and consists only in spraying the moss once every 2 to 3 days from a spray bottle. Such a miniature world will undoubtedly be appreciated by your family and friends. And you can be proud of your know-how. Despite the fact that the plants that will be in the bathroom are selected taking into account the preference of abundant moisture and shade, additional conditions should be considered for their growth and placement. Often in the bathroom temperature drops occur, which in turn leads to the appearance of mold and the multiplication of pathogenic fungi. You can avoid this by airing the room, leaving the door open at night. In bathrooms, where there is not even a small window, you should think about installing additional fluorescent lamps. If there is no such possibility, then at least for a few hours you take out the pots with flowers on the balcony or windowsill. 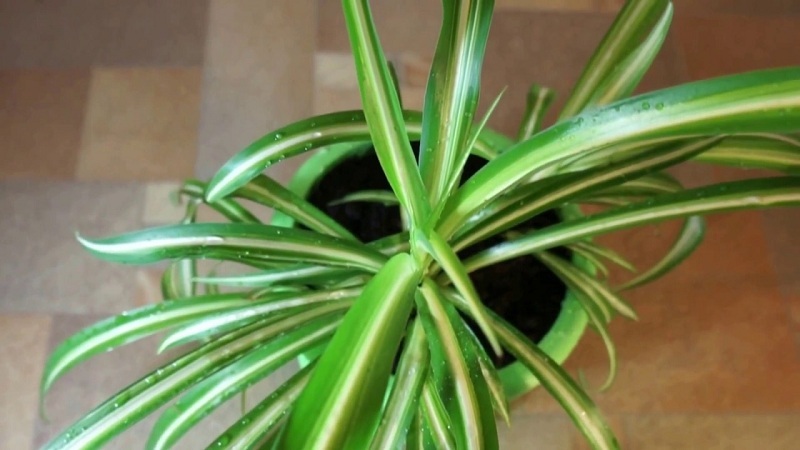 With regard to watering, then with high humidity in the room to water, the plants should be only when the top layer of soil in the pot begins to dry out. To ensure the normal breathing of plants, wipe their leaves as often as possible from drops of soapy water and toothpaste. Hanging plants will look spectacular on the shelves above the mirror. In the bathroom with a large area, you can arrange flowers in tubs at the corners, and on special curbstones, lush bushes will look good. To add romance to the flower pots, you can put on the wide sides of the bath, arrange candles nearby. But to make the evening intimate, of course, will help the bath with flowers. If you still do not decide to grow flowers in the bathroom, we advise you to think about decorating the interior with bouquets of fresh flowers or artificial compositions. In any case, you decide what colors to decorate the room! ← How To Propagate The Orchid?